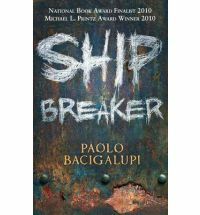 Paolo Bacigalupi’s young adult novel deserves a wide audience, as a great example of post-apocalyptic world-building in which the information the reader requires is provided when it’s needed for the plot rather than in great dollops of indigestible backstory. Ship Breaker follows young Nailer, whose greatest asset when we meet him is his size – or lack thereof. He’s useful to a beach gang on the Florida coast who strip everything out of the hulks that have been abandoned or wrecked and trade or sell it for cash. As the book continues, we realise that there is a functioning civilisation beyond Nailer’s small world, but he and the crews have created their own society which functions on loyalty and fear – especially fear of Nailer’s father, a drunken and drugged-up bully. However, when a “swank” ship is beached by a hurricane, Nailer’s loyalties are put to the test, as he seeks to help the one survivor get back to her people. Bacigalupi presents a strong package. The central theme of the novel is that family is what you make it – it’s got nothing to do with blood relatives – and between Nailer, his friend Pima, the survivor Nita and a genetically modified half-man called Tool, we see bonds forming and being tested. It’s also a gripping thriller – there’s a well-written sea chase at the end between two sailing vessels, and the final encounter between Nailer, his father and Nita evokes memories of the end of the 007 movie The Spy Who Loved Me.